[ Engineer's Plan Office, Great Western Railway, London. ] Original map titled ': 'COOKHAM STATION | Scale, 40 Feet to an Inch | July 1867'. [ Engineer's Plan Office, Great Western Railway, Paddington, London. ] July 1867. Original map in black ink, coloured in blue, grey, brown, cream, yellow, red. Titled: 'COOKHAM STATION | Scale, 40 Feet to an Inch | July 1867'. With stamp in red ink: 'TO BE RETURNED TO | ENGINEER'S PLAN OFFICE | G.W.R. PADDINGTON'. In ink on reverse: 'COOKHAM STATION'. Aged and worn. [S. Mary's College, Paddington.] Two printed prospectuses. The first (with photographic illustrations) for the 'Church of England Public School & Training College', and the second for the 'Training College for Secondary Teachers'. S. Mary's College, Paddington [London]. Both undated. ONE: Prospectus for the 'Church of England Public School & Training College'. 21pp., 12mo. Stitched. In blue card wraps, with the College's name printed in gold in a border on front cover. Printed on shiny art paper with four full-page illustrations: 'S. Mary's College' (frontispiece); 'College Hall'; 'The Kindergarten' and 'The Laboratory'. Good, on lightl-aged paper, in like wraps with creased back cover. TWO: Prospectus for the 'Training College for Secondary Teachers'. 7pp., 12mo. In blue card wraps, with the College's name printed in dark blue in a border on front cover. Manuscript Letter, signed on behalf of the London solicitors 'Moncrieff Webster & Thomson', informing Laurence Davidson, Writer to the Signet, Edinburgh, that 'P. White' of Paddington is ' a regular swindler'. 1 Old Palace Yard, Whitehall. 23 April 1831. 1p., 4to. Bifolium. Good, on lightly-aged paper. Addressed, with postmarks and docketing, on reverse of second leaf, to 'Lawrence Davidson Esq | W.S. | Edinburgh'. 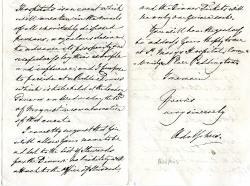 The solicitors write that they received that morning 'your letter requesting us to make enquiry as to the character of P. 2pp., 12mo; with the reverse folding out to make 1p., landscape 8vo, with the words 'CORONATION, 1911.' printed in red. The text begins on the first page beneath the firms letterhead: 'HOUSES LET OR SOLD. | RENTS COLLECTED IN ANY DISTRICT. | WEEKLY PROPERTIES MANAGED. | REPAIRS ECONOMICALLY EXECUTED. | DISTRAINTS LEVIED. | [...]'. The text of the announcement is headed, in red: 'SEATS TO VIEW . . . | THE CORONATION PROCESSION.' The first page reads: 'We have pleasure in submitting prices of Seats which we have To Let at | 41, KING WILLIAM STREET, E.C., | to view the Procession on June 23rd. 12mo, 31 pp. Ruled cashbook. Bound in vellum, marbled edges and endpapers, remains of clasps. Text clear and complete, internally sound and tight, on lightly-aged paper. In Stained vellum binding. 'Registration Cash Book' in large manuscript on front cover, and 'Godolphin School Collection | Commencing Xmas 1856.' on back. The first twenty-eight pages of the volume are headed 'Cash Receipts for Fees for Registration'. Autograph Letter Signed ('Adolphus') concerning the newly-completed St Mary's Hospital, Paddington. 15 March 1850; Cambridge House. 12mo, 3 pp. Good, on lightly-aged paper, with a little damage to the four corners of the second leaf caused by removal from mount. Thirty-five lines of text. Clear and complete. He has been afforded 'very great satisfaction' by the announcement that the Hospital 'is now so nearly completed' that it will 'a few weeks hence be delivered into the possession and management of the Governors'. It is a 'new, capacious and very necessary addition to our metropolitan Hospitals'.